Rome: Italy faces a week of strikes as the three biggest labor unions protest against Prime Minister Mario Monti’s €33 billion austerity package, which the government may soften slightly to meet some of their demands. After meeting with Monti late on Sunday, union leaders confirmed the series of strikes threatened after the austerity plan was announced last week. Port, highway, and haulage personnel strike today for three hours, and metal workers - including those at carmaker Fiat - are striking for the eight hours. Printing press operators will stop for a full shift, and most newspapers won’t be published on Tuesday. Public transport strikes will be held on 15-16 December. Bank employees will halt work for the afternoon of 16 December, and the public administration will close down for a whole day on 19 December. For the first time in six years of division, the three main union leaders will share a stage together when they speak to striking workers in front of parliament later on Monday. Union opposition will not affect parliamentary support for the package, Pier Luigi Bersani, secretary of the centre-left Democratic Party (PD), said on Monday. The PD counts many union members among its supporters. Bersani told Corriere della Sera daily said he shared union concerns about the effects of the tax increases and pension cuts on low incomes but his party’s backing was still assured. “We will be responsible. Our support isn’t in discussion," he said. “This budget correction is a message to Europe." 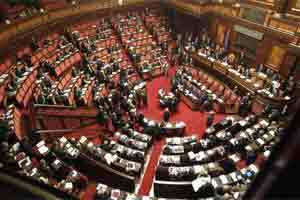 Unions accept the need for more austerity but say Monti’s plan is unfair. Rather than raising money by taxing pensioners and low earners, the government should be boosting levies on the wealthy, they say. “There are incomprehensible traits of inequality," Susanna Camusso, chief of the largest labour group Cgil, told la Repubblica newspaper on Monday. As yields on Italian 10-year bonds exceeded the critical 7% level, Monti on 4 December introduced a raft of measures including pension reform and hikes in property tax, sales tax and petrol tax. Borrowing costs fell sharply on optimism ahead of a European Union (EU) summit last week but have since crept back up, and rose above 6.8% on Monday after the summit failed to provide an immediate solution to the euro zone debt crisis. To meet demands from both unions and parties, the government is seeking other revenue sources or spending cuts to alleviate cuts to low pensions and to give property-tax exemptions to low-income families. The total cost of both moves would be €5 billion, parliamentary sources said. The deadline to amend the package is late on Monday.